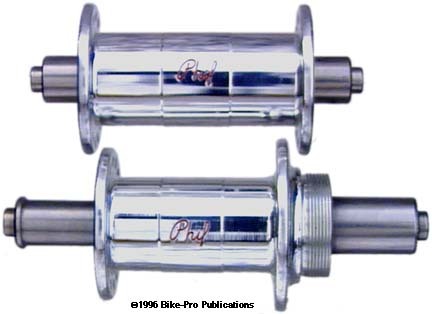 Phil Wood hubsets are produced in San Jose, California. They are one of the first two makers of hubs using precision sealed cartridge bearings. The hubs are made using a one-piece, aluminum construction. The aluminum shell is CNC machined from a single piece of aluminum rod, to a clean finish and then highly polished prior to the anodizing process. The shell is drilled through to reduce its weight, then bored from each end to make a recessed seat from the bearing. A Taiwanese NTN 6001LS8 slides into the bearing cavity. This bearing has a rubber outer seal and a metal inner seal, uses 8 ball bearing in a retainer, and is greased with Phil Wood grease. With one bearing installed in the front hub, a steel outer axle tube is inserted into the shell. The second bearing is placed in the shell, then the machined stainless steel axle slides through the hub, bearings and the outer axle tube in the shell. The steel axle has a 12mm outer diameter and has been cleanly machined to fit within the similarly machined outer bearing tube. The combination of the axle lubricated with Phil Tenacious oil make a very smooth operation. To hold the inner axle properly placed and reduce the diameter from 12mm to the needed 9mm for the fork end, a machined stainless steel axle cap is used. It threads onto the inner axle and has a 5mm hex fitting within the hole for the skewer. The 5mm hex fitting in cap permits the user to perform an easy field breakdown of the hub for inspection or service. The rear hub is for English threaded freewheel use only, and made following the same principles used to make the front. The shell, made as a single unit, is drilled through for weight reduction, then bored from each end to make a cavity for the bearings. Like the front hub, a bearing is installed in one end, then a steel outer axle tube is placed in the shell. The second bearing is installed then a machined stainless axle slides through the entire hub, bearings, and outer axle tube. The outer diameter of the rear inner axle is 15mm. The rear hub also uses machined stainless steel axle caps that thread onto the inner axle. These caps reduce the O.D. from the 15mm to the needed 10mm for the frame drop-out, and provide the proper spacing needed for each specific rear hub. The inner axle can lengthened on either side using these caps, making the needed hub length. These caps also have 5mm hex fittings broached into the end to make them field serviceable. Phil hubs come with a 28, 32, 36, 40, or 48 hole drilling, and the hubset can be split with different hole patterns front and rear. The axles come as a 100mm front, with the rear as a 126mm (6 or 7 speed road, 6 speed mountain), 130mm (7 or 8 speed Road, 7 speed Mountain), or 135mm (8 speed Mountain use). 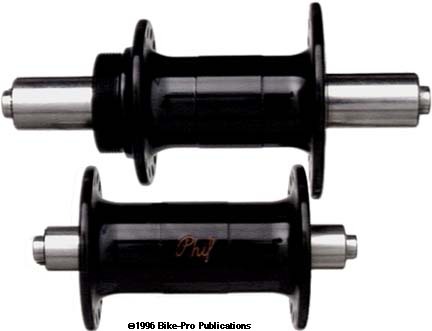 Phil hubs do not come with skewers and are made for freewheel use only (which is not included). The front hub has a 56.5mm hub flange diameter, with flanges spaced 69mm apart. The front spoke holes have a 48mm center circle diameter. The rear hub has a 66mm hub flange diameter on the non-drive side, and 57mm on the drive side. The rear flanges are spaced 57mm apart. The rear spoke holes have a 57mm center circle diameter on the non-drive side, and 47.5mm on the drive side. The front weighs 209.5 grams. The rear hub, with a 135mm axle spaced for 8 speed Mountain use weighs 297 grams. The hubs are anodized in Black or Silver, be sure to specify hole drillings, and rear axle length. Split hubs are available.